Learn more about risk factors for heart disease and what you can do to take charge of your own health today! With the HeartBright interactive communities and Take Charge! Cardiac Resource Centers you can start leading a heart healthy life now. Download healthy lifestyle handouts for your patients. Manage wellness groups and even utilize the Take Charge! Cardiac Resource database online. If you'd like to contact one of our Medical Advisory Members do so here as well. Members of the media can access our press kits, image downloads and press releases in our media area. 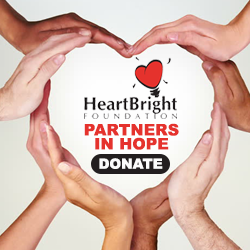 The HeartBright Foundation is a recognized 501(c)3.